OK, for those in the know, in the New Jersey wine scene, it's been very clear for a long time that Heritage Vineyards has aimed higher and higher. They are very modest and say they are a family farm. But let me tell you, this is one viticulturally energized and ambitious team! There is no question that Heritage wants to challenge Unionville Vineyards, or at least join Unionville Vineyards, as the best or one of the best wineries in New Jersey. I remember when they first opened. They made some nice wines, but I must admit I had no idea of the drive these folks possessed. I recently saw them this fall at the Garden State Harvest Festival. There, I was given a rare opportunity to share their best wines. was impressed, because usually you get to taste a few wines at a festival. But they brought everything. It's was a transcending experience. Heritage Vineyards is a family owned and operated estate vineyard and winery located in Mullica Hill, New Jersey. Mullica Hill is located in the heart of the Outer Coastal Plain American Viticultural Area (AVA), which covers over 2.25 million acres in Southeastern New Jersey. Named New Jersey’s “Winery of the Year” in 2011 and 2014 by the Garden State Wine Growers Association, Heritage has begun cementing it’s self as a benchmark producer in New Jersey’s largest wine growing region. 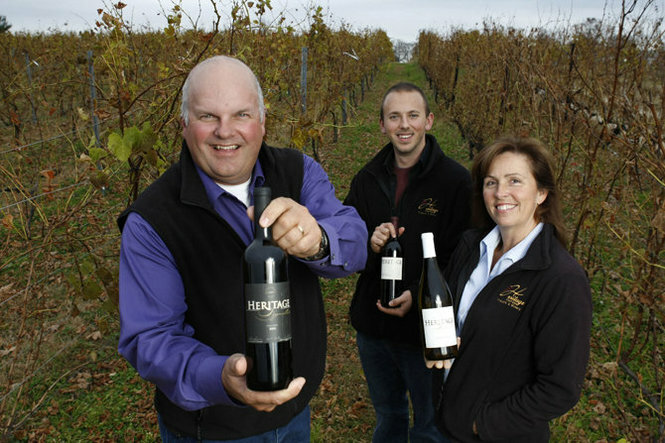 Cultivation of grapes began when Heritage Vineyards was established in 1999 by Bill and Penni Heritage. Seeing the potential of the emerging wine industry in Southern New Jersey, Bill Heritage, with the help of his wife Penni, started converting their 150 acre estate of peach & apple orchards into vineyards. Bill & Penni Heritage, represent the fifth generation of farmers who have tended this land. The winemaking team deserves some props, first off! It is a formidable trio of men who oversee the fruit's conversion to, there is no other word, elixir. Sean Comninos has been producing fines wines at Heritage Vineyards since the 2009 vintage. During his time with Heritage, he has garnered high praise from wine critics and the media. His 2009 Bordeaux-styled blend “BDX” was rated 94 points by the Beverage Testing Institute and marks the highest score for a New Jersey red wine from that publication. Sean studied marine biology at the University of the Virgin Islands. After college he traveled Europe extensively, nurturing his passion for wine. Sean graduated with the highest honors from the academic program at the Wine School of Philadelphia. John Levenberg is Heritage Vineyards' Winemaking Consultant. John Levenberg, a UC Davis grad, with a masters in Viticulture and Enology, spent nine years working at a number of wineries in California, France, and New Zealand. He was responsible for the first L’Absolut de Quinault (Bordeaux, France), rated by Wine Spectator as one of the three best wines in Bordeaux for the 2002 vintage. He was also former winemaker at Paul Hobbs Winery in California, where he produced 23 wines rated 90+ points by Robert Parker, including two 100-point wines. The glue in this group is Assistant winemaker Carl Hudson, known affectionately by the Heritage clan as the “Wine Wizard.” Carl is a retired chemist from Exxon Mobil. He brings great passion and expertise to the Heritage team. I would have to say that the team has also done a great job of separating their more inexpensive, picnic-styled wines from their higher-end selections. Better than many even in California. So that's another one-up they have in the wine game. OK, now on to the wines. This all estate Sauvignon Blanc 2013 was a huge surprise. Few people in NJ are growing Sauvignon Blanc. I know its something people are trying to grow more and more of in LI and the FL. So it was a nice thing to see a Garden State grown variety here. This varietal wine was right down the line. Big, lemony, floral, and zesty. Absolutely everything you want from a Sauvignon Blanc. Fabulous! Cuvee Blanc was another fabulous surprise! This is an unoaked Chardonnay-based blend. 88% Chardonnay, 6% Sauvignon Blanc, 2% Albarino, 2% Chenin Blanc, and 2% Pinot Gris. A lovely, lovely blend. Very bright and floral and zesty as well. A bigger, fuller wine than the Sauvignon Blanc, but still gorgeous!! The Estate Merlot 2011 and the Estate Cabernet Sauvignon 2012. The Merlot had hints of strawberry jam and lots of spice. Nice fruitiness upfront, with good acidity, which made for long-lasting flavor, and nice tannins which made for good balance. The Cab Sav was all dark cherry and bites of cassis. Nice whiffs of vanilla, cocoa and cedar. Both were very impressive. These were very good wines, and on any other east coast wine list would be up at the top, but more impressive wines were on the horizon in this tasting. The Estate Syrah 2012 was a big fruit bomb of plum, blackberry, and hints of cassis. Also notes of cola and cocoa. Great tannins. Nice structure. Very impressive. The Estate Reseve Syrah 2010 was THE BOMB!!! Amazing. Again plums, blackberries, cassis. But hints of darker things as well. A hint of prune or lakvar? Really, really impressive. Would have never guessed, tasting blind, that this was an east coast wine at all. More like California or Chile. An impressive, impressive wine, no matter the region. A must have!!!! This was Cuvee Rouge Third Edition, a blend of 13% Cabernet Franc, 11% Cabernet Sauvignon, 31% Chambourcin, 18% Merlot, 11% Grenache, and 16% Syrah. A lovely, lovely wine. Big notes of cherry, raspberry, cranberry, with lots of spice, hints of vanilla and cedar. Complex and elegant. An extremely lovely wine. I should note here, that the main grape is Chambourcin, and this wine shows what heights Chambourcin can achieve in the right winemaker's hands. An impressive achievement. This is the quintessential FU to all Chambourcin-hater out there...LOL. This Estate Chambourcin 2011 instantly became one of my absolute favorite Chambourcins. Again, in the hands of knowledgeable winemakers, Chambourcin achieves it's rightful place as a grape that can make exceptional deep, dry red wines worthy of serious consideration. A fantastic wine! Who would ever have guessed that this Chambourcin would be one of my favorites out of this truly impressive list of wines! Some nice Malbecs are being made on the east coast these days. I am enjoying them in New York state and Virginia more and more. But this new New Jersey entry offers immensely difficult competition to overcome. A big, dark, jammy classic Malbec. Almost tastes like one from Argentina or Chile. Maybe not quite as dark as that, but the wine itself deserves a place at the top of he list on the east coast for Malbec, and should not stutter in front of it's foreign brethren. This was an absolutely astonishing entry. Elegant. Gorgeous. Voluptuous. I'm gushing. I feel flush. But this wine is worth falling in love with. The Cabernet Franc 2012 Limited Release was another revelation. Again, this immediately joins the shortlist of any discussion of east coast Cabernet Francs. A big, fruit-forward wine filled with cherries and raspberries, accented with vanilla, graphite, molasses, and hints of herb and spice. A lovely, elegant, classy red wine, with which exudes power in the fruit and finesse in the finish. Excellent. Of course, the final addition to this list is the BDX Estate Reserve 2010. This easily joins the short list of best red wines on the east coast! Absolutely astonishing. But that's another review. Click the below link to read a separate review of that wine. It's too big to review here! You might see this all as puffery. But I tell you now, that if you scoff, you will be missing out. These are incredibly impressive wines And Heritage now joins the likes of Lenz, Wolffer, Bedell, Barboursville, Boxwood, Black Ankle, Glen Manor, and any other of the higher end east coast wineries that might automatically come to mind. Heritage, especially combined with their packaging achievements, has suddenly catapulted itself to one of the wineries that other east coasters (and some west coasters) should be emulating. How many east coast wineries can you say that about? WINEMAKERS, THIS SUMMER, BRING THE GOOD STUFF!